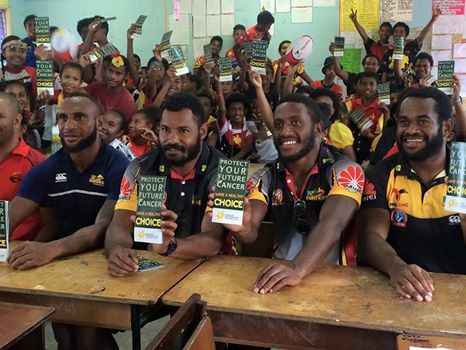 Peer pressure was the main message highlighted by SP PNG Hunters full back Stargroth Amean emphasized, when speaking to students of St Michaels Primary School today. Amean urged students not to involve in any groups in schools going on drinking and smoking rather live a healthy life style. He made this known during a cancer awareness drive in partnership with Cancer Foundation with four other hunters players. Also during the awareness PNGCF Health Educator Mr Jacob Oburi said research by PNG Institute of Medical Research suggested that one in ten deaths in PNG is because of cancer. He said one in three of cancer cases are preventable by simply choosing a healthy lifestyle. This was PNG Cancer Foundation in partnership with ExxonMobil (PNG’s ) Healthy Teens School Program for grades 6-8 students at St Michaels Primary School. Furthermore, PNGCF were pleased to have Silas Gahuna, Karo Kauna Jr, Butler Morris, Stargroth Amean and Watson Boas from SP Hunters participate in the Healthy Teens School Program as part of their community program in promoting healthy and active lifestyles in schools they visit.